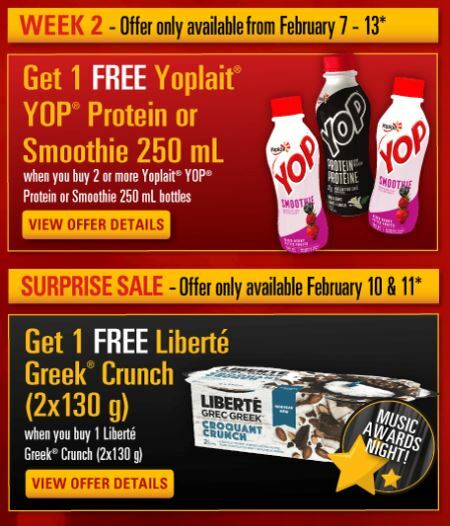 Snack & Save Canada Coupons: Buy One Liberte Greek Crunch Yogurt And Get 1 Free! The Snack & Save Canada coupon portal has added a brand new coupon offer today, in honour of music awards night. The Grammy Awards will be on this evening, and you can head over to the Snack & Save postal by clicking the link below, where you can print your buy one get one free coupon for Liberte Greek Crunch yogurt, 2x130g. The coupon is valid both today, February the 10th, and tomorrow, February the 11th. It is a store specific coupon, so keep in mind that you may only use it at the following Loblaws banners: Loblaws, Atlantic Superstore, Provigo, Zehrs, Valu-Mart, Independent, and Fortinos. Click here to visit the Snack & Save Canada coupon portal.